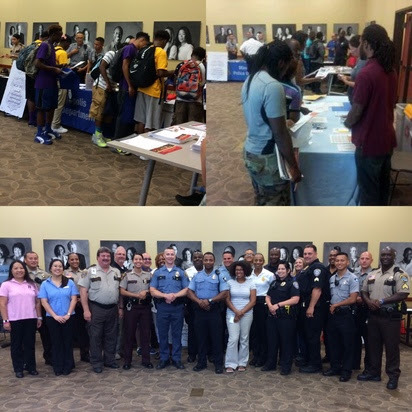 On Saturday, July 25th the Neighborhood and Community Relations (NCR) Department co-hosted a Public Safety Career Fair along with the Minneapolis Police Department’s Community Engagement Team. The event was held at University of Minnesota Outreach-Engagement Center (UROC) in north Minneapolis. NCR’s African American Community Specialist, Ayianna Kennerly organized the event as part of her work to form relationships with the African American community and the City. The goal of the career fair was to inform the African American and other under-represented communities of the diverse array of public safety careers that are open available to apply for within the Twin Cities. The career fair also aimed to provide a positive platform for engagement between law enforcement, public safety liaisons and under-represented residents. Learn about 13 jobs at 911 that will be available in the fall and six City jobs advertised by Human Resources;. Build lasting relationships with participating agencies. The event was also the first public safety themed career fair held in Minneapolis that brought together a wide array of local public safety agencies, including: The City of Minneapolis Public Safety Departments; Hennepin and Ramsey County Departments; Minnesota State Patrol; Hennepin Emergency Medical Services; Metro Transit Police and the University of Minnesota Police Department. This collaborative effort established the ground work to build a larger, more diverse, applicant pool for the City of Minneapolis’ workforce. To learn more about Ayianna’s work with the African American Community, please visit: http://www.ci.minneapolis.mn.us/ncr/outreach/WCMS1P-143452. The City Academy will be held weekly on Wednesdays from September 23rd through October 21st at locations throughout Minneapolis. Each session will focus on one aspect of City government such as public safety, public works, planning and development and fire services. Sessions will run from 6:30 to 9:00 PM. The program is open to all Minneapolis residents who are 18 years or older. The academy is filled on a first-come, first-served basis. Please complete the application form that can be found online: http://www.minneapolismn.gov/ncr/MinneapolisCityAcademy. The Neighborhood and Community Relations department is holding the second of two meetings to get the public’s input on the Blueprint for Equitable Engagement, a multi-year strategic action plan to ensure an equitable community engagement system for the City of Minneapolis, and will guide the work of NCR and the Neighborhood and Community Engagement Commission through 2020. The next meeting will be held on Tuesday, August 11th from 6:30-8:00p.m. at Heritage Park. For more information and to download a draft of the Blueprint for Equitable Engagement Plan, please visit: http://www.ci.minneapolis.mn.us/ncr/initiatives/WCMS1P-141685. On Thursday, July 23rd the City of Minneapolis held a celebration honoring the 25 years of the Americans with Disabilities Act. Over 80 peopled attend the event. 4th Street in front of City Hall was closed to car traffic to allow for dancing in the street by Young Dance, a mixed ability dance group; obstacle course demonstrations with therapy dogs from Canine Inspired Change; and accessible vehicle demonstrations from Metro Transit, Rollx, Airport Taxi, Yellow Taxi, and Green and White Taxi. An Excellence in Service Award was presented to Wilderness Inquiry by the Minneapolis Advisory Committee on People with Disabilities. Wilderness Inquiry received the award for work in making outdoor programs accessible to everyone. Honorary Recognition Awards were given to the Metropolitan Airports Commission and Vision Loss Resources for their continued efforts to the disability community. Besides observing the milestone, Minneapolis and its partners are focusing on improving engagement, participation and quality of service for people with disabilities. The City of Minneapolis has started a thorough Americans with Disabilities Act evaluation of its own programs and services to identify possible barriers to residents. The Americans with Disabilities Act, is a law that bans discrimination on the basis of disability in employment, public accommodations, public services, transportation and telecommunications. It’s viewed as the most comprehensive civil rights law for people with disabilities. 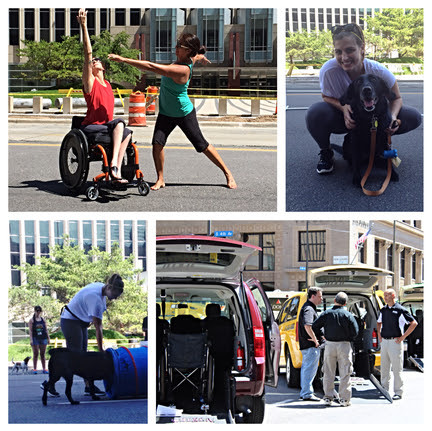 The City’s Neighborhood and Community Relations Department and Department of Civil Rights organized the celebration in partnership with the Minneapolis Advisory Committee on People with Disabilities, the Minneapolis Park and Recreation Board, and the Metropolitan Council. Windom Park Citizens in Action, $25,000. For project narratives and more information, please visit:http://www.ci.minneapolis.mn.us/ncr/programs/CommunityInnovationFund. Each community served by the Neighborhood and Community Relations department Access and Outreach team now have webpages designated for their work. Check them out here: http://www.ci.minneapolis.mn.us/ncr/outreach/index.htm. If you are one of about 7,000 households signed up and living in the first phase areas of citywide organics collection, you’ll soon get to start. City crews will deliver the first green organics cartsAug. 10-Sept. 18. Minneapolis residents are great recyclers, and now they can keep even more useful materials out of the trash. More than 31,000 households have signed up for green organics recycling carts. To take part, residents must sign up by contacting Solid Waste and Recycling at 612-673-2917 8 a.m.-4:30 p.m., Monday-Fridayor SWRcustomer@minneapolismn.gov. The second phase of the rollout begins in the spring of 2016. Once the rollout is complete, all Solid Waste and Recycling customers who sign up will be able to take part. More information is available at www.minneapolismn.gov/solid-waste/organics. You can now see the City’s 2014 Comprehensive Annual Financial Report and updated balance sheet on the City’s financial transparency web page:minneapolismn.opengov.com. The report presents the official audited financial report for the City as of the close of the 2014 fiscal year end. It includes both financial and non-financial statistical information about the City as of 2014. To see the report, go to minneapolismn.opengov.com and click on “filters.” A link to “ 2014 CAFR” will appear at the bottom of the left side menu. The City is pleased to have received the “Certificate for Achievement for Excellence in Financial Reporting” from the Government Financial Officers Association for its CAFR for the last 44 years. . The City of Minneapolis Police Department is now accepting applications for Police Cadets. The application period is open now through August 21st.Click here to learn more. For reasonable accommodations or alternative formats please contact Cheyenne Brodeen, 612-673-3737 or Cheyenne.Brodeen@minneapolismn.gov. People who are deaf or hard of hearing can use a relay service to call 311 agents at 612-673-3000. TTY users can call 612-673-2157 or 612-673-2626. Next Post Truck Extravaganza Saturday, August 8th – Thank You! !